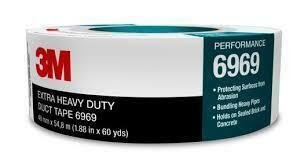 3M™ Extra Heavy Duty Duct Tape 6969 is an industrial strength duct tape that is abrasion and moisture resistant. The tape consists of polyethylene film over a dense cloth scrim with an aggressive rubber adhesive used for demanding duct tape applications. 3M Extra Heavy Duty Duct Tape 6969 offers industrial strength backing, easy tear, abrasion resistance and tack-free edges. Individual roll wrap preserves integrity of the roll for less waste. The rubber adhesive adheres aggressively to most surfaces for good holding power. Typical physical and performance characteristics include: thickness: 10.7 mils, adhesion to steel: 61 oz./in. width, tensile strength: 32lbs./in. width, elongation at break: 16%, temperature use range: Up to 200(deg)F.
Automotive, Electronics, Furniture, General Industrial, Metalworking, Military & Government, Specialty Vehicle, Transportation, Woodworking. Jhanvi Innovative Solutions LLP has carved a niche amongst the most trusted names in the market and commenced in the year 2016. Ownership type of our corporation is partnership. Our company’s headquarter is situated at Shalimar Bagh, Delhi. We are involved in trading a wide range of Electrical Insulation Putty, Electrical Joint Compound, Electrical Contact Cleaner Spray and many more. We have adopted strict quality testing measures that have been recommended by the food industry. Also, we make packaging of the entire range using best quality packaging material, which protects them from external environment as well as retain the freshness and original value of the products. Apart from this, our assurance to customers is to make timely shipment of the orders specified by them.